"Work appears well done. A pleasure to work with this company." Add stability to your construction site or retaining wall with soil nailing from Keystone Foundation Repair. It's a building and foundation preparation method that can save you time and money while also provided added structural security. We use our construction and design experience to provide effective and affordable soil stabilization solutions. Soil nail installation is a relatively fast process that involves fewer construction materials than what's needed with other methods used for the same purpose. With this type of installation, the soil is retained, and anchors are used. It's typically done with wire mesh and shotcrete to keep a slope stable during building or foundation preparation. The soil nail technique is used to retain the natural slope during the construction process. Soil nail installation may also be used as a permanent solution in situations where it's important to prevent slope failure or erosion on a long-term basis. What Are Common Uses for Soil Nail Installation? Excavation support: Removing soil to clear a site and prepare it for a new construction sometimes results in slopes that could present certain risks for construction personnel. One solution is to create a soil nail set-up. Stabilization of slopes and landscapes: Landscapes or other areas of residential or commercial properties sometimes become unstable from exposure to the elements or because of issues with gravity. Soil nail installation is a quick and easy way to provide some extra reinforcement. Retaining wall repair: Retaining walls sometimes become damaged over time from normal wear and tear or the deterioration of materials, especially wood. 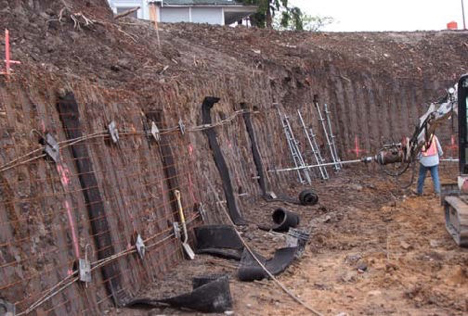 Soil nails can sometimes be installed to re-stabilize a retaining wall, which may eliminate the need for complete replacement. How Is Soil Nailing Done? At Keystone Foundation Repair, we typically use hollow bar grouted rock anchors or helical anchors to provide the needed stabilization. Soil nail installation is usually done in incremental stages. It's a convenient process that can be done from the top down as excavation work progresses. With excavations, soil is usually excavated in 3-6 foot stages. After each stage, holes are drilled into the exposed face. Steel bars are then placed into the holes. After grouting the bars in place, a drainage system is usually installed before the application of shotcrete facing. Bearing plates are attached to the heads of soil nails. This process is repeated until the preferred wall depth is reached. What will be left is an area of reinforced ground that's safe for construction workers or builders. A similar process is used for retaining walls. The equipment typically used is small enough to get into areas with limited access. With retaining walls and other existing steep slopes, soil nails can be installed from working platforms that are crane-suspended. What Kind of Precautions Are Taken?